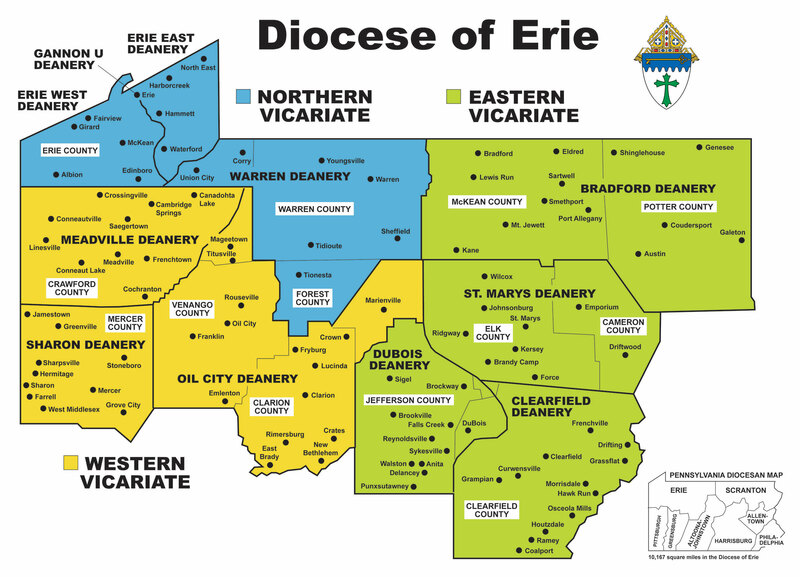 The Roman Catholic Diocese of Erie is composed of the thirteen counties of Northwestern Pennsylvania with a Catholic population of about 222,000. Geographically, it is the largest diocese in the state covering 10,167 square miles. The diocese is primarily rural (farm lands, fields and forests) with one large city, Erie (the See city) and two medium metropolitan areas of Sharon and Meadville. Serving the diocese are 117 parishes and 18 missions, with about 184 clergy and 326 religious women involved in various ministries. We educate 8,494 students in elementary, middle and high schools for the 2011-2012 school year; our religious education programs involve close to 11,750 children and youth. With faith in Jesus Christ and commitment to living Gospel values, The Roman Catholic Diocese of Erie, in communion with the Universal Church, serves the people of northwestern Pennsylvania. Through evangelization, education, charity, service, the proclamation of Word and the celebration of Sacrament, the mission of our Community is to call forth the gifts of individuals in order to enable each person to advance the reign of God and achieve full human potential and salvation in Christ.